Another quick and dirty melting basket photo. But I make up for it with the pretty book set up later on, I promise. Wax tarts I melted last basket that I loved enough to want to buy again: Glitterati Monkey Bread, VCS Autumn in Salem, Bohemienne Life Third Eye and Saturnus (SO GOOD), CFTKR Vanilla Pumpkin Marshmallow (picked up another bag this past weekend) and Merlin's Forest. If you would like any of these scents reviewed in depth, please let me know which ones in the comments. Helllooooooooo, Nurse! 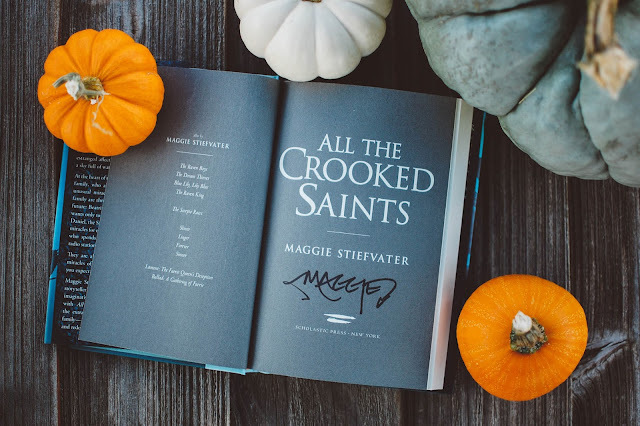 The beauty of Maggie Stiefvater's newest release, All the Crooked Saints arrived in all its polished and shining glory this past weekend. 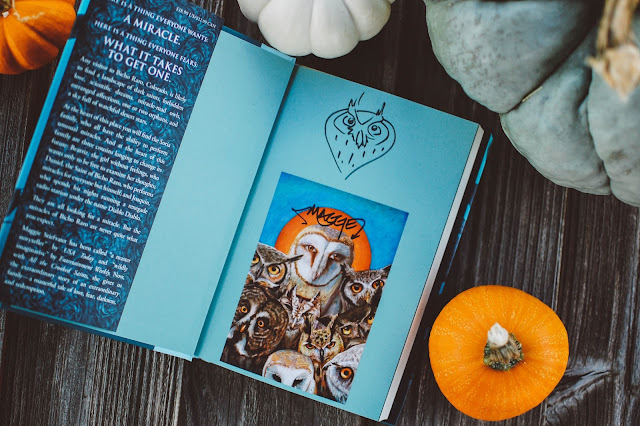 I pre-ordered this book from Fountain Book Store in Virginia where Maggie will autograph and doodle books for their customers who order from them. I ordered this back in April and paid $19.99 plus a few bucks for shipping. You may recall my sister and close friend drove up to Jacksonville to listen to Maggie give a brief lecture and do a meet and greet over the summer. It was a great day. She not only writes books, but also is an artist and musician. She sketched out the owl in the front cover and then painted this intricate owl portrait which was made into a bookplate and signed by her. She also signed the inside title page. I just finished up a book a friend of hers wrote, Blood Magic, but now I am ready to dive into this tome. 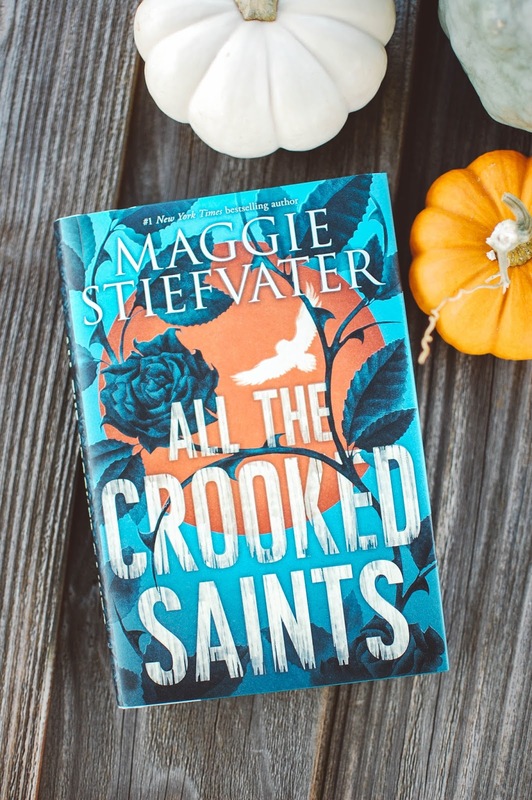 Other Maggie Stiefvater books I recommend: The Raven Cycle starting with The Raven Boys, The Scorpio Races, The Wolves of Mercy Falls series starting with Shiver and hopefully this one too. She has a faerie series as well but I have not started it. What are you currently reading? Have you visited any pumpkin patches or engaged in any fall time fun? I am so ready to melt that Apples & Cinnamon and crack open this book. THOSE OWLS!!!! I'm currently reading the second book in the Hex Hall series (about witches and demons) and have the next book in the Magisterium series on its way to me. YES!!! It was decided and I am being a rebel because I am kinda itching for some Christmas scents but being super sneaky about it. LOL! Yes! Scorpio Races was signed and gifted to me by a friend and all my other Stiefvater books are signed now since I brought them to the meet and greet. I wouldn't mind if an accident happened... I would probably just buy another one. She signs all her books at Fountain Bookstore so they are kinda easy to get. I am just happy you liked it. I need to go back and read your review of the first book. I am on a witch book kick too. Must be the spooky month of October.